As has become somewhat of a tradition, my friend Eric hosted his annual holiday dinner recently, and this year's feast took place at one of our City's most iconic restaurants, Spago. 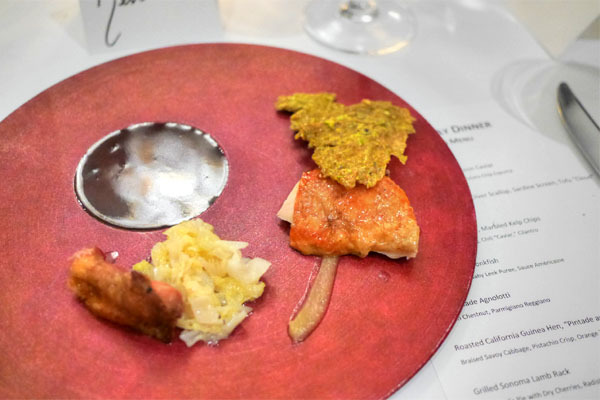 We booked their "Private Dining Room #1" (my first time doing a PDR at Spago) for 15 people and enjoyed the California Tasting Menu, priced at $145 plus $75 for wine. Click for a larger version. 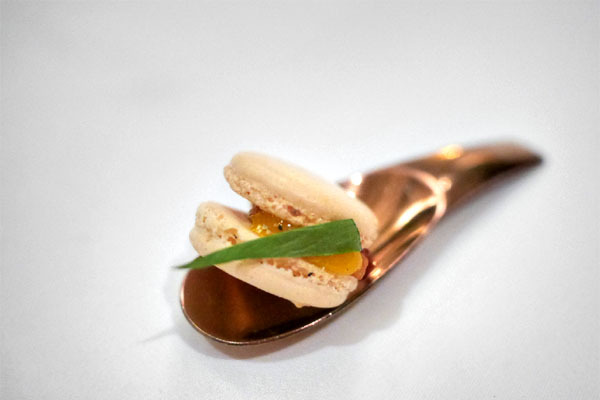 Our amuse came in the form of a maple macaron with bacon and egg yolk jam. Great, salty, porky bacon flavor here finishing with a lingering sweetness, though I could've used a lighter, more delicate texture on the actual biscuits. 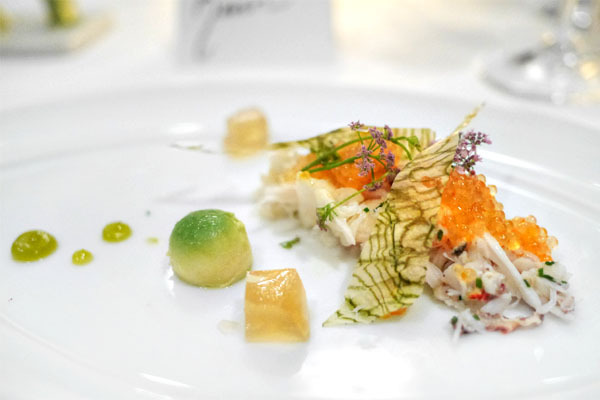 The first proper course brought out a masterful, fanciful presentation of caviar. 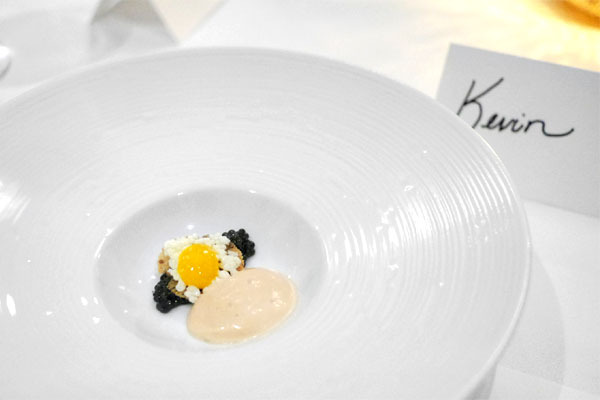 The piercing saltiness of the roe paired perfectly with the egg yolk jam and crispy rye, but the crux of the dish was that espuma, which had a Ruffles-like goodness and savoriness to it that really brought it all together. Creamy and luxurious and a great start to things. 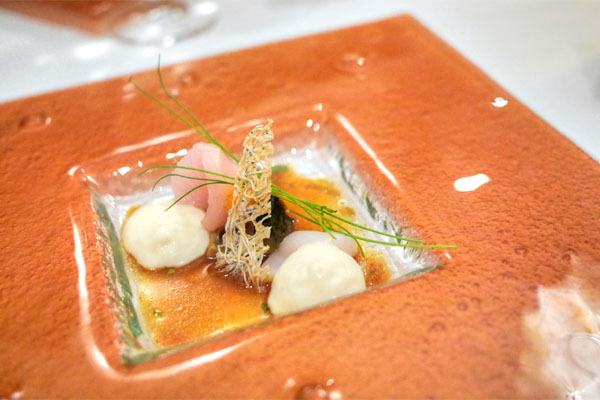 Three types of seafood--yellowtail, abalone, scallop--resulted in a multifaceted brine and a contrast of textures, their inherent salinity balanced by the silky globules of tofu present. The best part though? That salty, crunchy, umami-laced sardine chip, which reminded me of the dried fish snacks of my childhood. 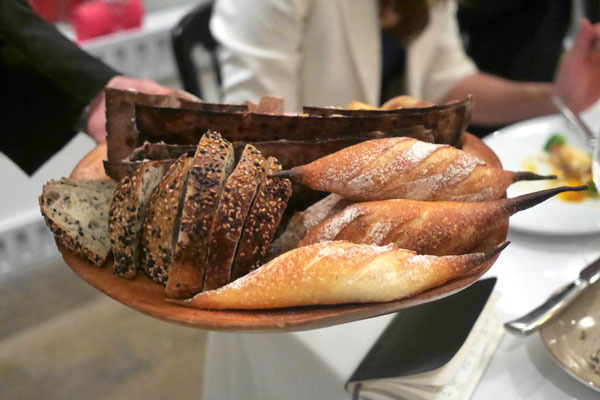 Breads--baguette, sesame, olive, lavash, cheddar walnut--were superb, and came accompanied by heady seaweed and delicate Wisconsin butters. 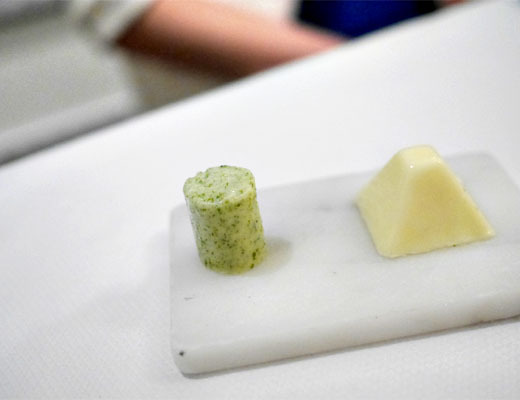 Dungness was delightful, beautifully textured and oh-so sweet, deftly perked up by a prick of yuzukosho, a dash of dashi, and the herby zing of cilantro. Loved the savoriness of those crunchy kelp chips, too. Following was quite possibly the best monkfish I've had. 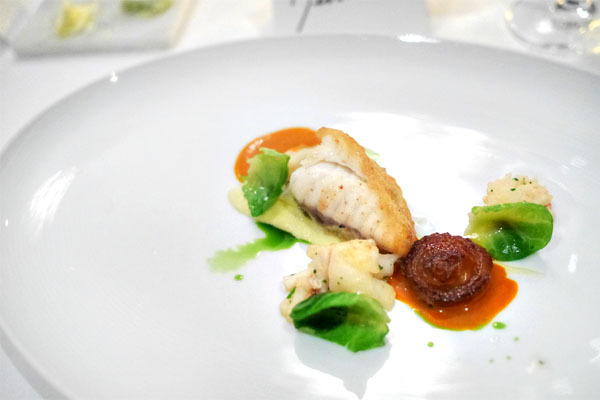 Meaty and dense and slightly spongy to the bite, the fish was perfectly cooked, its comforting flavors meshing well with the Brussels and leeks while the sauce Américaine added a bisque-like richness to the dish. Wonderful aromatics here as well. 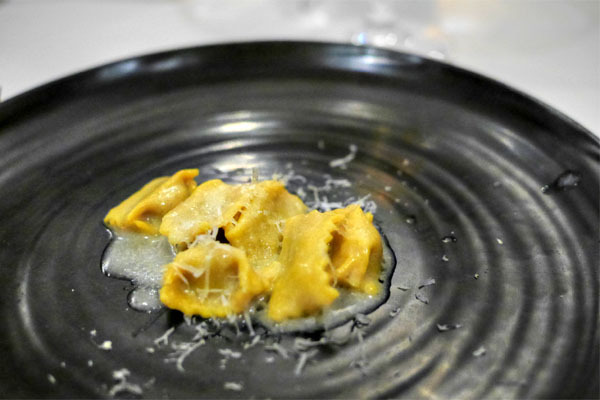 It's seemingly hard to escape from a meal at Spago without getting served some sort of housemade agnolotti, and tonight's version featured the seasonally apropos chestnut. Sweet, nutty, and with a hit of salt from the Parm, this was a homey, holiday-tasting dish. 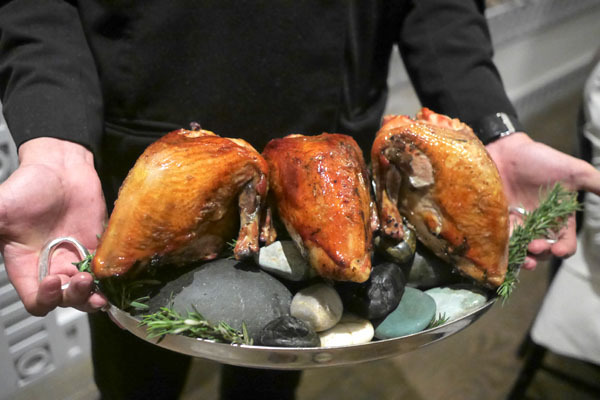 A trio of guineafowl, presented tableside prior to carving for our next course. Said hen was served in both breast and leg portions. 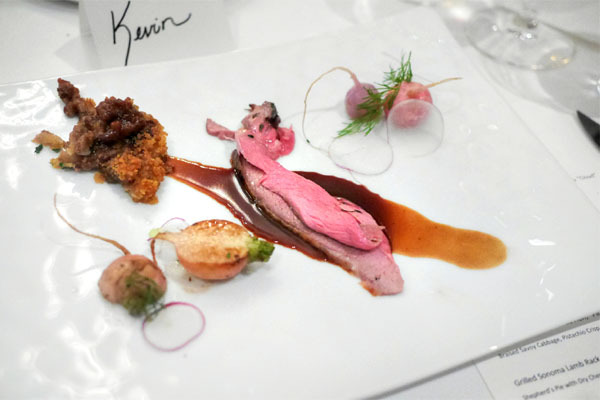 On the right was breast, flavorful and tender, with a particularly enjoyable skin. The dark meat was prepared confit and was expectedly deeper, richer in flavor, and worked swimmingly with the side of bitter, braised cabbage. 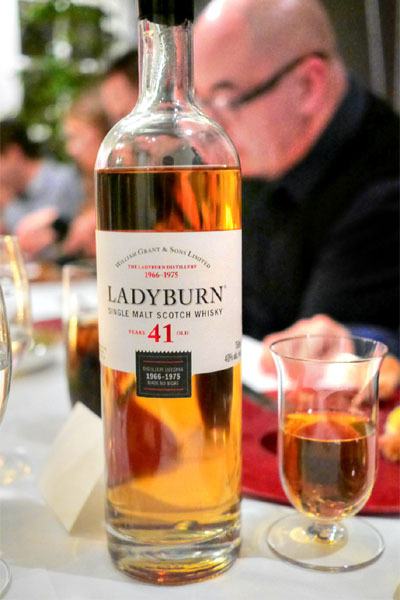 One of my dining companions was wooed by the age of the Ladyburn 41 Year Old Scotch Whisky and decided to order a glass, at a cost of something like $360 (thankfully I wasn't paying). The whisky came from a long-dormant distillery, which operated only from 1966 to 1975. I don't have a particularly refined palate for Scotch, but did enjoy this, finding the liquid fruity, smooth, yet understated on the palate, with a heady, spicy, woody nose. 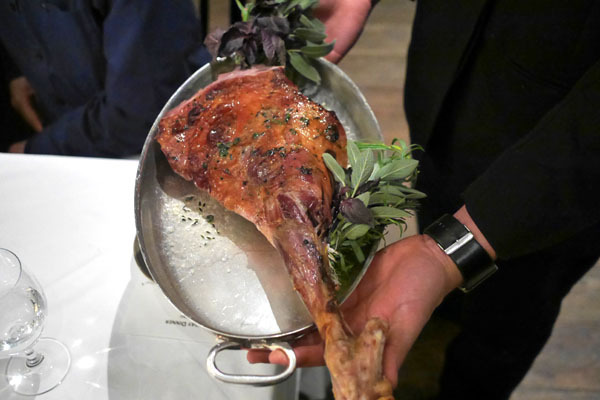 The tableside presentation of the lamb leg for our final savory course. Slices of the leg were thus plated, their savory, yet restrained ovine goodness smartly balanced against the crisp bitterness of radish. I appreciated the inclusion of a shepherd's pie here as well, a cozy sort of side dish. 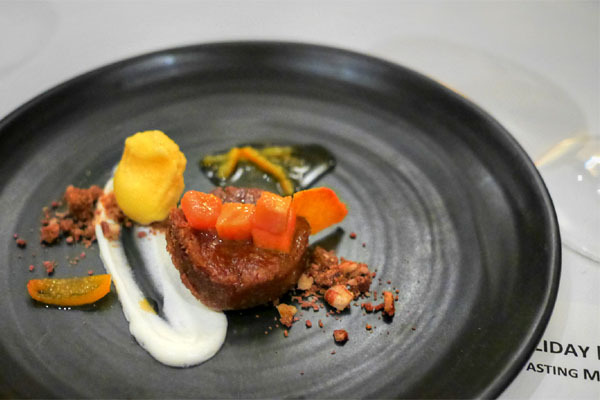 In our first dessert, persimmon was nicely presented, its relatively mild flavors amped up by a palpable sweet spice while the citrusy sherbet provided an appropriately tangy counterpoint. 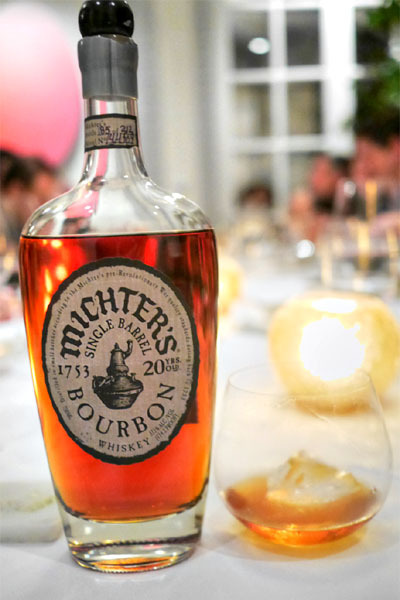 Some at the table opted for more brown liquor, such as the Michter's 20 Year Old Single Barrel Bourbon Whiskey. One of only 212 bottles produced, this one had lots of fruit for me, along with some buttery, nutty nuances all in a smooth, surprisingly easy-drinking package. 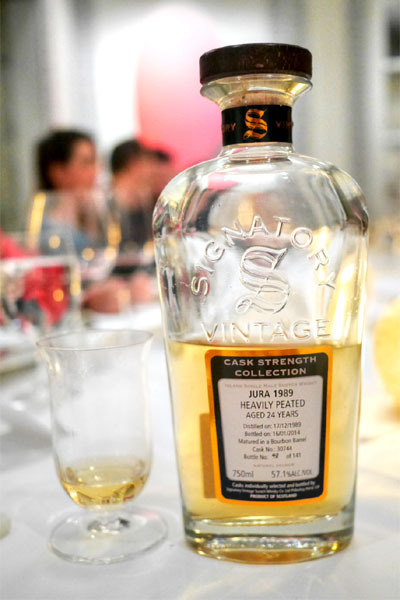 The 1989 Jura Signatory Heavily Peated Scotch Whisky [$60], meanwhile, was even rarer, with only 141 examples bottled. I got loads of vanilla here, but less peatiness than I'd anticipated. Lots of spice and wood on the palate, and very viscous to boot. 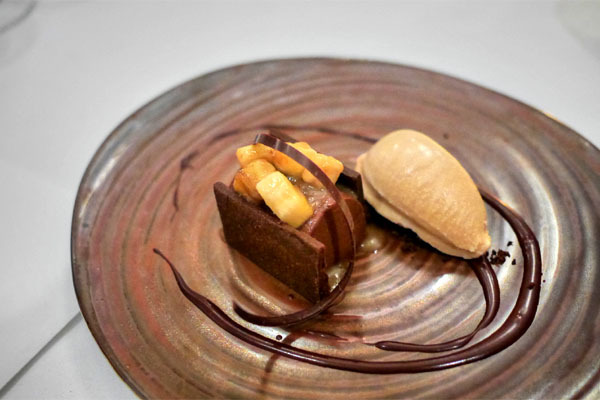 Lastly, the essential chocolate dessert delivered as well, giving up rich, classic chocolate flavors tempered by the zestiness of citrus. Good textures on the plate as well, and I didn't mind the banana here, either. Another solid showing from Spago. I do like the lighter, more modern style that the restaurant's been espousing since its remodel, and I certainly appreciated the additional coddling of being seated in the private dining room. Despite being over 30 years old, the place is still somehow relevant, so it'll be curious to see for how much longer. Definitely worth a visit for any Angeleno who hasn't already been. A glass was $360, or what...? My cousin also has a bottle of Johnnie Walker the John Walker that runs about $3000 for a 750mL bottle... These liquors can run a pretty penny. No mention of the pappy? Can't remember if you got some. I don't remember seeing the bottle either. Josh: I don't think that what it used to be was necessarily better. I'd argue that the old menu catered to the moneyed-yet-boring BH crowd. Anon: Yep. As I said, thankfully I wasn't paying. Anon: $2000 indeed. I'm curious about that John Walker. I was actually gifted a bottle of the 200th Anniversary edition. Unknown: We did get some, but the bottle was never brought out unfortunately.